What is Mobile-First Customer Engagement? — Mobile-First Customer Engagement is the key to attracting today’s omnichannel shoppers. Have you ever discovered a fashion brand while scrolling on your smartphone, but then went and tried (and possibly also bought) the clothes in a physical store, perhaps after checking a review on YouTube? If your answer is yes, you’re in good company: a recent study stated that in 6 cases out of 10 customer engagement is a seed that is planted in your smartphone, but that blossoms later in-store. Proving that the line between online and offline is more blurred than ever. According to Mckinsey’s State of Fashion 2019, ‘mobile-obsessed’ is considered by far to be the most impactful trend of the past year. This behavior is not only limited to the younger, digital-savvy generations – although it is being more amplified in both Millennials and Gen-Z – it’s actually cross-generational. Making smartphones the main touch point for where customer engagement happens. The reasons behind this mobile-first frenzy in the fashion industry are composed of different factors. First of all, basically everyone (read: any potential customer) has one: by 2020, active smartphones users are forecasted to be 3.5 billion in total, with a spike in countries such as China and India where fashion and luxury brands have the most potential to grow. Second, we don’t just carry smartphones 24/7 with us, we use them as substitutes for the good ol’ television (for finding inspiration, keeping updated, filling our daily downtime...) to such an extent that, last year, over 51% of smartphone users discovered a new company or product while conducting a search via their mobile. If this was not enough, smartphones’ infinite amount of channels, which one can potentially access, is extremely targeted, fueled by the data we have given to third parties throughout our online years and making the mobile experience more meaningful than any other: most of the times, your device knows what you’re looking for before you know it yourself. Luckily enough, fashion is one of the most change-driven industries. A vast majority of brands today are already understanding how crucial smartphones are for engaging with their customers and have started filling their channels with micro-moments such as catwalks’ backstage videos on Instagram TV, brand-selected playlists on Spotify, and much more. But, (and there’s always a but) investing in creating varied and meaningful digital content and in expanding a brand’s presence online, with a special eye on the mobile experience, is not always enough to convert customer engagement into an actual purchase. Why? Because if it’s true that most customers like to find inspiration on their phones, it’s also true that in the vast majority of cases they won’t buy on the same channel the engagement took place on - chances are, the purchase will actually more likely happen in a brick-and-mortar store. This tendency is widespread across the retail industry but is extremely relevant in the fashion sector, where the physical experience (experiencing the exclusivity or values of a brand hands-on, touching the cloth, trying the garment on) is something inherent in its DNA. This proves that if fashion retail players want to thrive in the future, they do have to think mobile first, but they have to look at the bigger picture as well - developing a coherent omnichannel strategy where real life plays a role that’s as leading as the mobile one is. 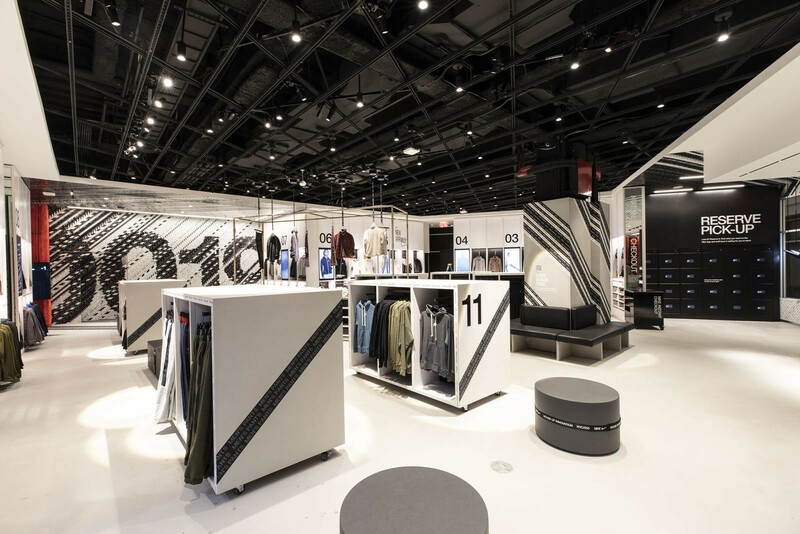 The most cutting-edge and notorious example of the process of merging mobile with the offline experience is provided by the foot and sportswear brand Nike, which recently opened a futuristic, 68,000-square-foot flagship store in New York that raises the mobile and in-store integration shopping experience stakes massively. The store even contains a basketball court and an “experience treadmill” where customers can try out shoes “on the field” before buying them online and have them delivered within 24 hours - also brilliantly solving the ever-increasing customer impatience when it comes to waiting for shipping times. The Nike store is just the tip of the iceberg; there are many more examples of how fashion brands are embracing and conjugating what we could try and define as a “mobile-first, offline-second”, or, better, an “on and off”, experience. What should be clear by now is that that the game of the future of retail is being played on a slippery field: that of mobile customer engagement. A game that will be won by those players who will prove to have the greatest ability to engage customers through their smartphones and take them to the next touchpoint in the most frictionless, coherent, and streamlined way, never forgetting that the in-store experience is one that is making an important comeback. And always bear in mind the following: digital has not just changed our buying habits, but also the way brands with engage with us. Because, at the end of the day, most of your current and near-future customers will be digital natives: and, to them, online and offline are two sides of the same coin.